As you probably know, another mass shooting happened Friday — this time in the Chicago suburb of Aurora, Illinois. Five people were killed in the rampage, and several others were wounded and sent to the hospital — mostly police. Once again, a massacre happened in a gun-free zone, where the shooter understood that he could get his “fifteen minutes of fame” without worrying that anyone would fire back. * Illinois now has a “red flag” gun confiscation law. * Illinois has universal background checks. 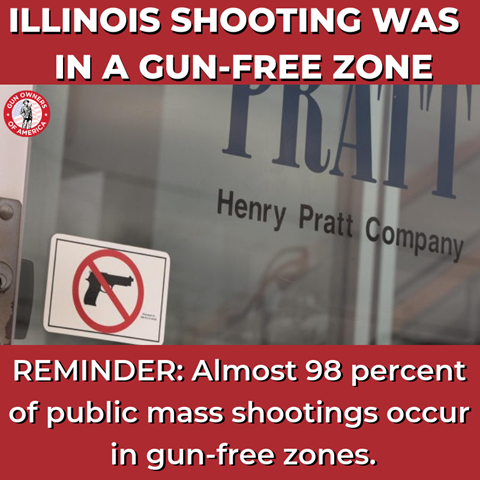 * Illinois has gun bans and gun free zones. * Illinois has licensure and gun registry — issuing the infamous “FOID Cards” as a prerequisite to gun ownership. In fact, Illinois has every form of gun control which gun-grabbers say would keep us safe if we enacted it on a national level. And yet, Chicago is one of the biggest centers of violence of any city in the country, with almost 600 people being murdered in 2018. Of course, Illinois has now clocked another mass shooting. Not surprisingly, this particular mass shooting didn’t get a lot of play in the media. The New York Times ran it “below the fold.” The Washington Post didn’t even put it on the front page. Unfortunately for the five victims, their deaths couldn’t be exploited by the media to achieve a political objective. But the one thing which might have kept those five people alive is if one of the potential victims had had a gun. What we need is to encourage more concealed carry and repeal gun free zones. Sadly, Nancy Pelosi won’t be pushing real common-sense legislation any time soon. Instead, the House of Representatives will be voting on various gun control proposals next week, including Universal Background Checks (H.R. 8). So it’s a good time to remind your legislators that, from the Land of Lincoln, we just got another lesson in the failure of gun control. Thank you for taking action. It’s important that Congress continues to hear from you, the voter.